Meet our new Marketing & Communications Administrator Olly! 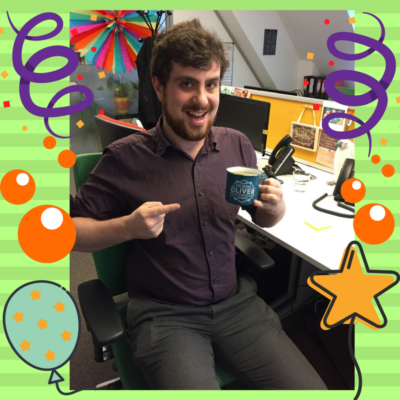 Last month we had the pleasure of welcoming our new Marketing and Communications Administrator, Oliver (Olly!) to the Pharmacist Support team. Olly will be working alongside Kate (Marketing Manager) and Emma (Fundraiser) in helping to deliver and monitor key charitable awareness raising and income generating activities. After a month with Pharmacist Support we checked in with Olly to see how he was doing. My employment history has been varied! I’ve tried it all – from working in warehousing and labouring to training as a Financial Advisor and Relationship Management Advisor. However, I did not find any of these roles fulfilling, so in 2017 I decided to take a year out to complete a Masters in European Philosophy at MMU and in this time work out what it was that I wanted to do. I soon discovered this was to work for a charitable organisation in a role where I would be able both to work with people and also make use of my analytical skills and very nerdy love of data. I’ve recently moved from North Cheshire to Stalybridge with my girlfriend and am enjoying getting settled into a new area. My interests outside of work are fairly conventional; I love sports in all forms, love music of basically every stripe from metal opera to chamber pop, I am an avid reader and a great fan of horror and fantasy fiction, especially the short stories of HP Lovecraft! What is it that attracted you to this post? Working for an organisation that has helping people at the centre of its values was definitely a requirement and at the core of where I was looking to work. Alongside that it was the opportunity to work in a communications role, where I am able both to deal with people and work with a lot of data in a role that would let me focus on using this data towards a specific end or target. This is a tricky one! I’d say the analytics of social media and the PS website. I really enjoy looking at trends in data and seeing what impact certain changes to behaviour can create. Spotting trends and working out patterns is something that always fascinates me. Of course having the opportunity to work alongside some really great and passionate people is fantastic!